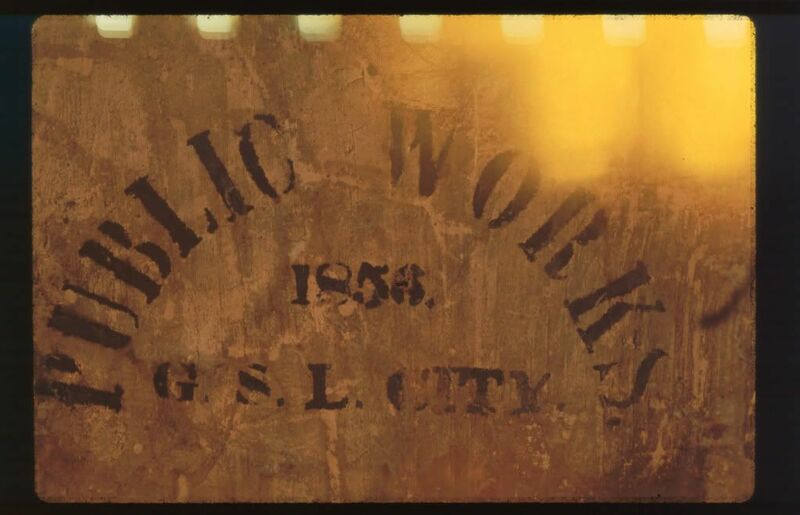 This is the stencil on the underside of Chairs made at the Public Works in Great Salt Lake City, Utah Territory in that year. It is from the underside of a Gondola Chair that had been made for Brigham Young. There are many examples of these chairs including 26 I have made. My reproductions have a stencil that is 15% smaller than the original, in order to tell the difference. Here is another scan of the 35 mm slide that I did with the dust and scratch removal feature on my new Film Scanner. This is the first in what will be thousands of slides and negatives that I will be able to preserve digitally. I am very pleased with the results and this scan is not anywhere near the maximum resolution of the scanner. The flare at the top is from the original slide, a few of these occur because I typically didn’t advance the film as far as recommended in order to squeeze out an extra frame or two. Perhaps you could say more about the film scanner that you chose, its features, why you chose it, how well (or not) you like it, and whether (or not) you would recommend it to others. I intend to post more pictures as I am initially happy with the results. Looks a lot better than something shot with one of those flat bed scanner mirror pyramids. This Film Scanner is the PrimeFilm series PF7250u and I purchased it from CostCo. It was on sale and ran $170.00 delivered. I checked out other versions and this one looked the best, there are some cheaper and when I first looked into a scanner for my slides the range was 3 to 4 thousand dollars. I am going to do the same scan at the highest resolution of the same image and see what it looks like. I have only used the dust removal feature and there are several others I am interested in exploring. I also have some dim images of Yellowstone Stage Coaches that I worked on as well as many others. The higher resolution and more functions that are turned on add to scan time and file space.